While we trusted, based on their impressive restaurant portfolio, the Racanelli’s wouldn’t let us down on fabulous ambiance, food, and drink, we were eager to check out all that Lugano Wine Bar & Salumeria has to offer after watching it being built up over the past few months. We were probably most excited by their amazing selection of artisan meats and cheeses from their Salumeria, their wine and cocktail list, and their variety of Italian tapas . . . you know, pretty much everything. When we arrived, we were valet-parked and got our seats right away. Conicidentally, we sat in the same exact spot where we sat during the past two iterations of the space (Palomino & Bistro Latino). As we shared during our preview post, the bar is a stunning and lavish White Carera Marble and the seats are clad in a rich and exotic red leather that just oozes comfort. It’s very Zaza, Molto, and Dolce, but more “Industrial Chic,” as Nick Jr. told us, putting it in a league of its own. Well, let’s get down to it and dig into the food (much like we did). First off, we went a bit crazy with the meats and cheeses, but we were hungry and needed something in our bellies STAT. You can order meats and cheeses individually or you can order them up in special platters, too. 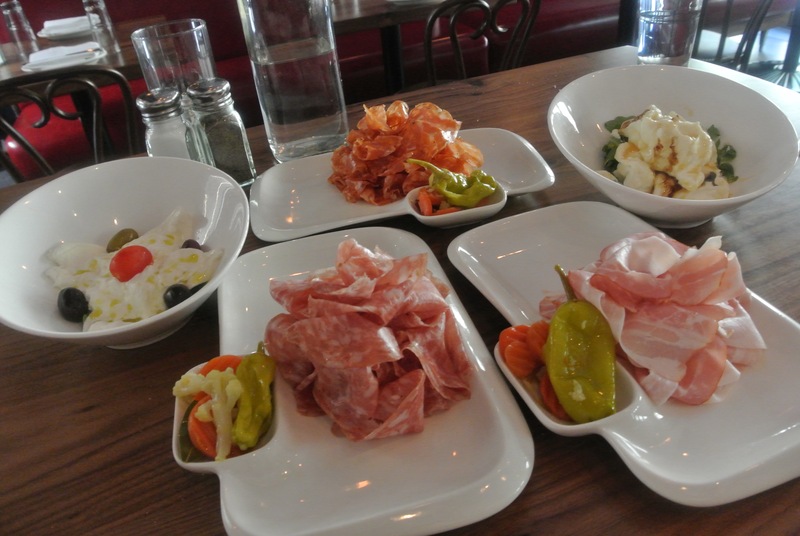 In addition, there are small bites for you to order alongside the meats and cheeses like Polenta Fritta, Marinated Olives, Garlic Bread, Cauliflower Fritti, and Giardiniera. While we have had a few of the meats on the menu already, we wanted to try some of the rarer and harder to find kinds that the Lugano staff were so proud of. The first we tried was the Smoked Panchetta which had beautiful marbling and just the right hint of smoke. Second was the Salame Calabrese which Nick Jr. had told us to try a month ago. Unlike so many other meats that claim to be spciy (but are just lame), this one had a nice gentle creeping heat to it. And, arguably our new favorite was the Finocchiona because the fennel came through so nicely but wasn’t overpowering at all. All were sliced paper thin and really just melted away into your mouth. And, while it was tough to pick the meats, it was even tougher to pick which cheese to order. Considering our outright addiction to burrata, we had to place an order of the Burratina. It comes cut apart, is somewhat creamy on the inside, and is a bit denser on the outside. Overall, it was a decent burrata, but I think we’ve been spoiled by the amazing, freshly made-on-the-spot burrata at Brick + Wood, making all other burrata pale in comparison. We also ordered the honey glazed ricotta which came out in a very large portion. So much so that we got three extra orders of bread just so we could spread a lil’ on each piece. Oh, and it was great: the ricotta was creamy and airy with the honey adding a nice sweetness to all of it. At this point, we were feeling good and could have ended the meal satisfied, but that would be very un-OmNomCT of us, now wouldn’t it? Damn right, so we ordered the Meatball Tasting which had three balls together for $9.50. Up first was the Classic Beef which was delicate, moist, airy, and light. Next in the tasting was the Turkey ball which had that nice savory taste you expect from good turkey, but was a bit denser than the beef. And, finishing up the plate was Spicy Beef which again was airy but had a spicy kick that again creeped up on us. 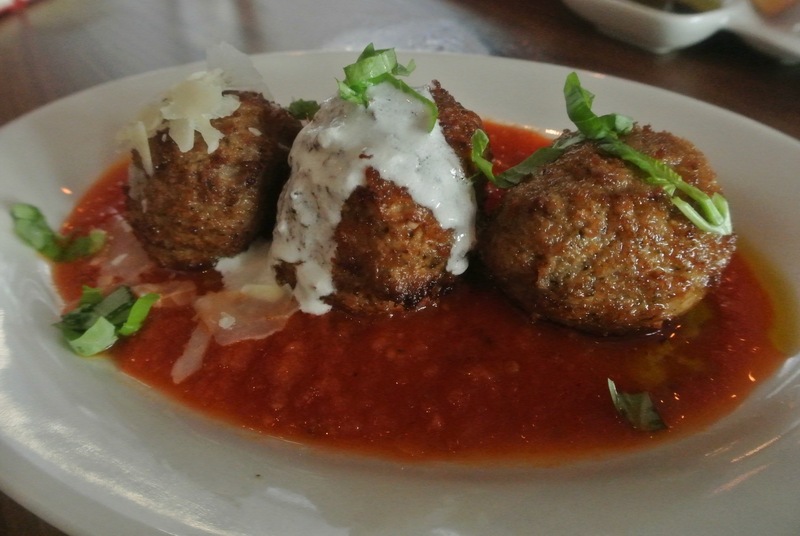 All the meatballs had a crispy crust along the outside and we dug the nicely balanced sauce which was tangy, chunky, with the right amount of saltiness. From here, we decided to try out the Spicy Pork Ribs, the Polenta with three meat ragu, and the Spicy Fried Italian Peppers just to get a taste of the apps that they offer. Without a doubt, the Spicy Pork Ribs were a highlight of the night for us. The ribs slid off the bone with a gentle tug, they had a nice heat going on, and had that awesome balance of rich and tangy from the vinegar. We’d order these again and again. Up next was the polenta which was creamy, but could’ve used more salt and flavor. And, while we liked the lamb and beef on top, we felt like the dish overall was bland—there needed to be more sauce, or more of an acidic contrast going on in the ragu. And, finally, we finished up (so we thought) with the Spicy Fried Italian Peppers. The aroma on those peppers was amazing, so we dug in. And, while there was a nice flavor from the grill, the peppers were also on the bland side with no (or too little to taste) seasoning. As we got our check to pay, wouldn’t you know it, dessert shows up, courtsey of the house. Oh Lord, have mercy. So, we dug in with what remaining space there was left in our bellies, and got down to business. First we took bites of the Cheesecake which was very creamy and not too sweet at all. In addition to that perfect balance, it was rich, but not dense. And, tying it all together was a bright and vibrant rasberry sauce. A very nice cheesecake indeed! We were also treated to a Molten Lava Cake. Now, we’ve got something to say about Molten Lava Cakes. We’ve stopped ordereing these because they always just end up tasting like a cake with a tiny drop of “lava” inside. But, we’re happy to report that this cake was overflowing with lava inside once we took our forks to it. There was definitely a nice, rich, chocolately taste and it was (also a nice surprise) actually hot! So, wrapping it all up, we liked a lot about our first time at Lugano. The meat and cheese options are the big highlight, especially if you’ve got a nice glass of wine or cocktail in your hand (which they have a great selection of). We would go back here just for these options, no doubt. Also, we’d definitely get the Meatball Tatsing again becaue it was delcious, but we’re a little cautious about that with the price for just three meatballs. Now, while nothing is priced too expensively, it does add up after a bit if you get a little app happy like us. But, considering the prices of Italian in Greenwich, Lugano remains a moderate option with good quality. And, while we did note that some of the dishes needed a lil’ more sumin sumin, they’ve been open for a very short time and are still finding their way through their new restaurant no doubt. We’ll be back again to be confirm or update our first impressions. Cuz, you know, that’s how we roll! 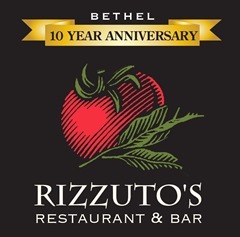 In December of 2004, Bill Rizzuto started Rizzuto’s in Bethel. The menu featured good, classic Italian dishes paired with brick oven pies fresh out of the oven. As the success for the Bethel restaurant grew, Bill expanded Rizzuto’s into West Hartford, Westport, and Stamford. With expansion also came evolution, as they began to focus more on small plates, drink selection, and new concepts like recently adding more of a sports vibe to their Stamford spot. Rizzuto’s Bethel is located at 6 Stony Hill Road. Although we’ve always been obsessed with discovering and sharing great places to dine out in CT, back in 2006 (when we lived in Black Rock) we were just developing our professional eating and dining abilities. We’d check out the hottest spots in the area, and (of course) we’d also try out the newest restaurants. One such restaurant was Viale, which we saw being built, start to finish. Ever the intrepid explorers, we had a meal during the first few weeks of their opening. While we didn’t remember all the details of our first meal so many years ago, we do remember the meal to be decent, but no amazing. 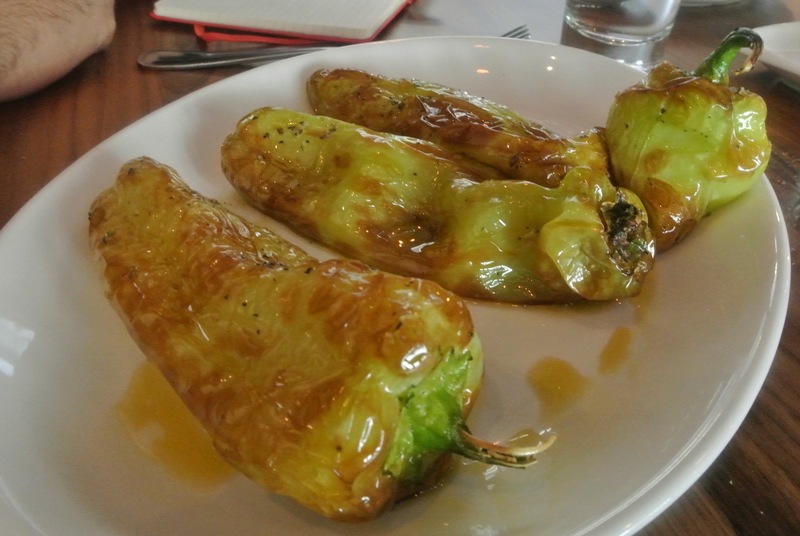 Now, fast forward to a few weeks back when we were invited to come in and try Viale again. We were very interested to see if things were the same or if they’d improved, especially now that we have so many great places to compare it to. Zeppole. Doesn’t that word instantly make you smile and drool at the same time? Yes, those fried pillowy puffs of doughy goodness that make you feel like a kid again, are the things that dreams are made of. It’s because of that, that we’re proud and excited to announce that we’ve teamed up with Zeppoleme of Port Chester for an exciting, “A Night out with OmNomCT and Friends” event on 1/30 at 7 pm. You’ll have a chance to meet and talk with both of us and the awesome Zeppoleme owners Marc Tessitore (he also owns Nessa next door) and Robert Squeri as we all chow down on some killer good food and drink some delicious wine. If you haven’t had the chance to eat at this awesome restaurant that we have raved about (and The New York Times too), then you MUST get in on this dinner on 1/30 starting at 7 pm. There will be enough food and wine to feed an army of OmNomivores for just $29 + tax and tip. Now that’s a deal! Call them up at (914) 481-5900 to make your reservation and get your spot…only about 25 seats, get calling! Brace yourselves. Are you anchored down? Good, let’s forge ahead. Bar Sugo in Norwalk is opening up for lunch and brunch and will soon have outdoor seating. Yeah, we know…that’s awesome. Lunch (from 11-4) will start on April 1 (not a joke, punks) and will feature much of the same dinner menu, but they’ll also be adding some panini, more salads, and a burger. Oh, but to call it a burger is selling it short. It will be a house dry aged Ox Hollows Farm beef burger with red onion jam, gouda, rosemary mayo, and a Sport Hill farm egg on top, served on housemade brioche. Chef Pat and co. will also be offering cold fried chicken with crispy speck and pickled mustard, too. Brunch (11-3) starts off on April 7 and Pat promises that it will be like a brunch that you’ve never experienced before. We’re talking about old Italian countryside kind of brunch, unlimited bellinis, and special dishes such as lemon pancakes with lemon custard and lemon butter or Sport Hill farm eggs and pork belly from Millstone. A couple of weeks ago we broke the news that one of our favorite burger joints, Beach Burger had closed. In its place, we discovered would be a pizza place. We weren’t sure Norwalk needed another pizza shop in the area, but then we heard from friend of OmNomCT, Joe Sforza. His dad is opening Dino’s Pizza Pie up on February 18 in that spot and Joe will be the manager. While some might say it’s another pizza joint, we’ve eaten at Via Sforza and the food is warm, rustic, and authentic Italian. Dino will be carrying over the quality, recipes, and passion for great Italian flavors to this location. Appetizers: Burrata with cucumbers and marinated fresh tomatoes. Salads and Soups: Fried Calamari Salad with Romaine and hot cherry peppers, dressed in Caesar. Pasta: Cavatelli Nonna with arugula, fresh tomatoes and onions in a light tomato sauce with garlic, topped with shaved ricotta salata. Grinders & wraps: Sausage, peppers, and onions. Doesn’t get better or more simple than that! Stromboli & calzone: They have two standard options to pick from and also have 23 fillings available for you to make your own masterpiece. We live in the Springdale area of Stamford and sometimes we just don’t have the energy to go all out and cook up a nice dinner. And, sometimes, just sometimes, we are so starving that we need good food at a good price, stat! Nick’s Pizza, in Stamford, is our go-to spot when we want great standard Italian fare on the cheap and at our door quick. The antipasto there is solid and I have to order it with every single meal and the pasta is great, especially when we order the baked cavatelli. One of our favorite things about Nick’s, though, are these tiny little hunks of bready goodness that they send along with their meals… so delish. Well, today they’ve announced a coursed dinner (below) that will be highlighted with wine pairings from around the world. Nick’s has really been stepping up their game lately and I think this pairing shows they’re working harder than ever. Now, it’s hard to pass up a chance for a meal like this, especially when it’s so close and it’s so affordable.We’re talking 35 bucks, here, not too shabby. Make sure to make your reservations asap, their number is listed at the bottom, but you know we do that at the end of every post, don’t ya? Homemade neapolitan lasagna with bite size meatball, fresh ricotta, mozzarella and parmesan.